Baby Swim Class | Daily Life in Japan, Muravej Co.
Katya and I took Mariya to “Nakadate Sports Center” in Kofu. 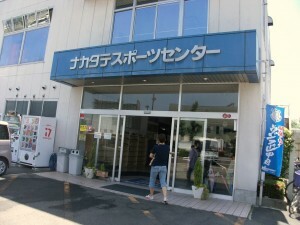 The center has an 86-year old history. 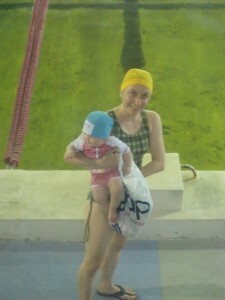 Katya went to check the swimming pool last week for Mariya’s swimming lessons. Katya and Mariya went into the pool, while I watched them from the second floor. The water in the pool is GREEN because it is natural hot water from 300-m depth. The green color is that of chlorophyll. Actually, I did not see them well and got bored after 10 minutes. Katya said Mariya enjoyed the class. An instructor told me the same. Probably, Katya and Mariya will join the class from June. This entry was posted in Daily life, Katya, Liesure, Mariya and tagged Katya, Kofu, Mariya, Nakadate Sports Center. Bookmark the permalink.